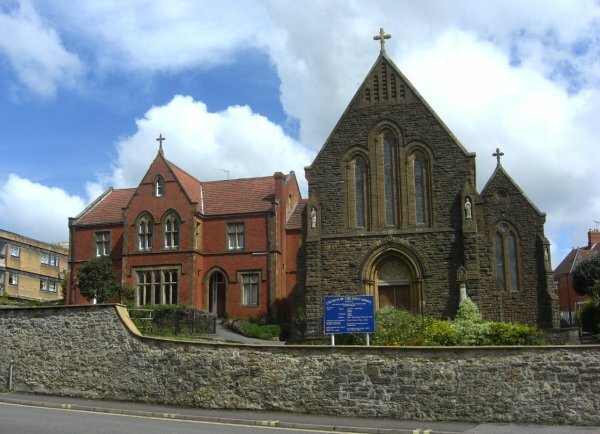 As the Reformation took hold in Yeovil in the 16th century, the parish church of St John the Baptist was closed and within a few generations Yeovil had become Protestant. A list of recusants compiled between 1592 and 1606 gives the names of just 7 people (five of them named Hawker) living in or near Yeovil. 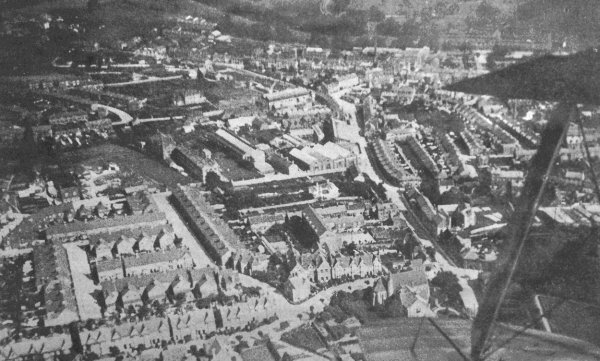 By 1887 there were only six Catholic families in Yeovil but to hear Mass or receive the Sacraments they had to travel to Marnhull, Wincanton, or Sherborne. Charles Gatty, editor of the Western Chronicle, persuaded the Bishop to make it possible for Mass to be heard in the town by the Carmelite Fathers of Wincanton. This took place at Gatty's home on Hendford Hill with his drawing room being converted into a chapel. 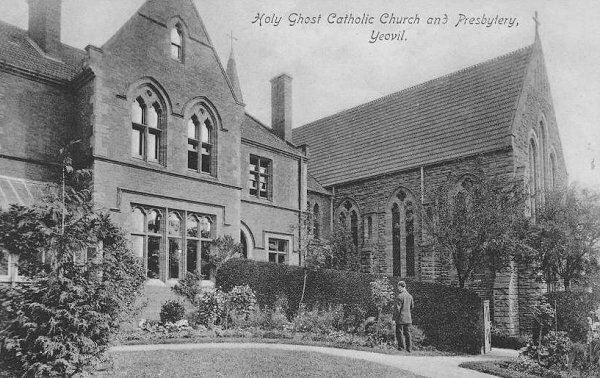 The first post-Reformation Mass in Yeovil took place on 13 November 1887. As the congregation grew, Gatty's chapel became too small so the congregation rented the Chantry in Church Path. In 1896 Captain Prowse, Lord of Kingston Manor, sold some seven acres of land north of Higher Kingston to the Reverend (later Canon) AJC Scoles, an architect and the parish priest. 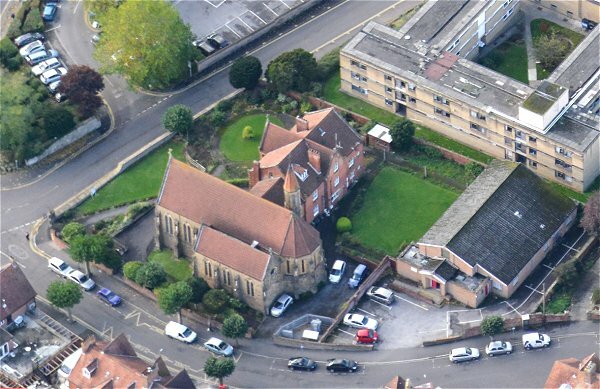 The purchase was to provide land to build a new Roman Catholic church, a presbytery and a school. It was also proposed to build a new road with housing intended to be "an avenue forty feet wide". 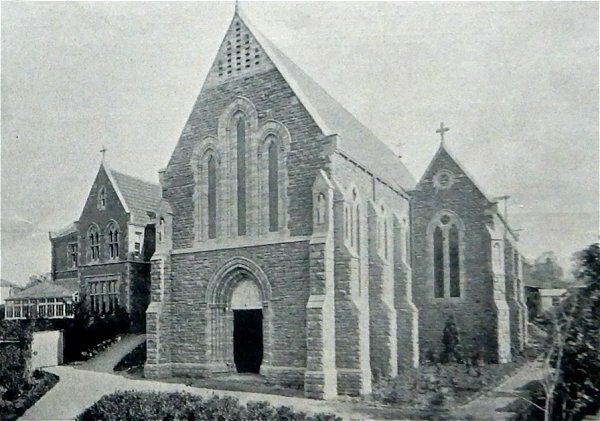 The Church of the Holy Ghost was built between 1894 and 1899 and The Avenue was constructed alongside at the same time. The church is built in rock-faced limestone with freestone dressings under a red clay tile roof with stone coped gable ends with apex crosses. Built in the Early English style, the church has a five-bay nave with a polygonal apse, a three-bay Lady chapel and a vestry on the north. A polygonal tower is in the northwest angle. Both the nave and the chapel have tall, two-light windows with plate tracery, continuous hood moulds and buttresses with niches containing statues of saints. At the eastern end of chapel is a cusped rose window. To the west end of the nave are large tripartite lancets. The west doorway has two orders of shafts, a deeply moulded arch and a carved tympanum. The church contains a fifteenth century carved cross head which was found in the fabric of the Chantry of St John's church when the Chantry was being demolished by local builder John Rawlings. A replica stands outside the church. 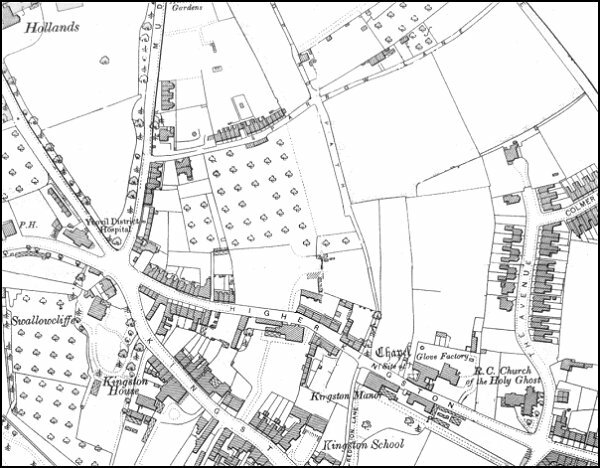 The 1901 Ordnance Survey showing the Church of the Holy Ghost at bottom right at right. This photograph was taken by Yeovil Photographer Jarratt Beckett and published in his 1897 book "Somerset viewed through a Camera". 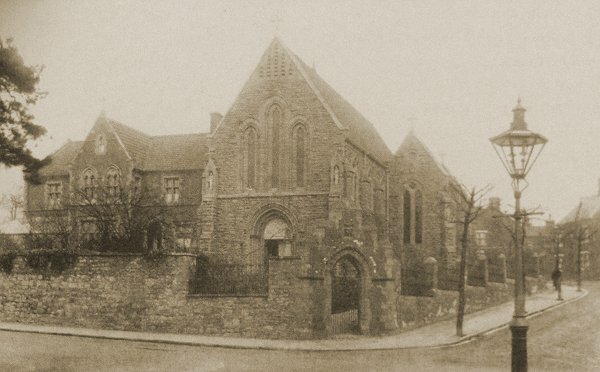 Probably one of the first photographs of the new church. The Church of the Holy Ghost photographed around 1900. An almost identical view used as a postcard, again from around 1900. 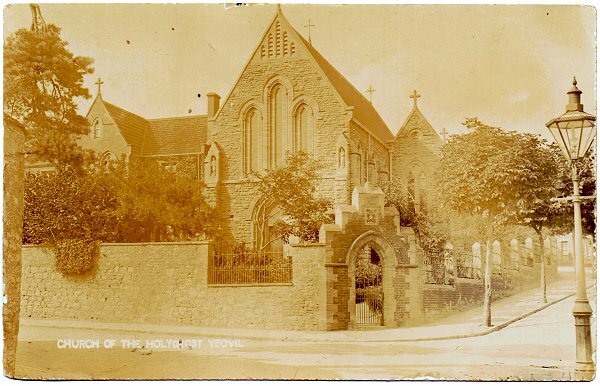 An undated postcard, but probably dating to around 1910, showing the Church of the Holy Ghost and the Presbytery. This postcard, and the following three, were published by Lofthouse, Crosbie & Co of Tower House, Trinity Square, London - the address dating this set of postcards to before the Great War. 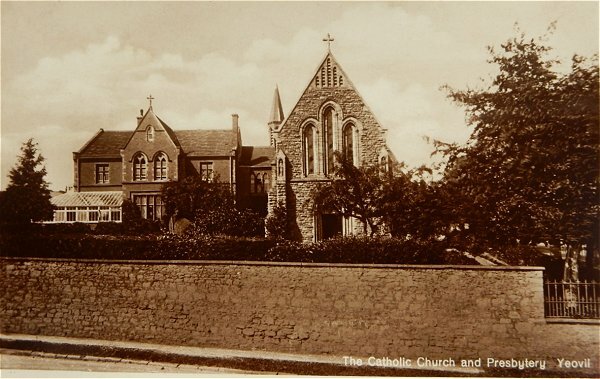 The company specialised in producing postcards of churches, schools and other institutions, to be sold by the institution. 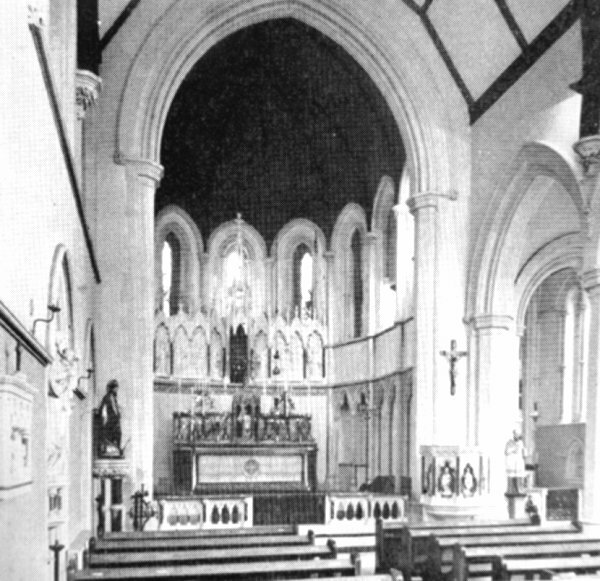 This postcard shows the interior of the church. 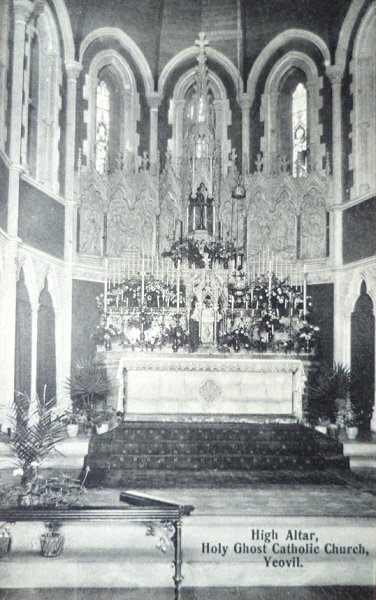 A postcard of the same set showing the High Altar. 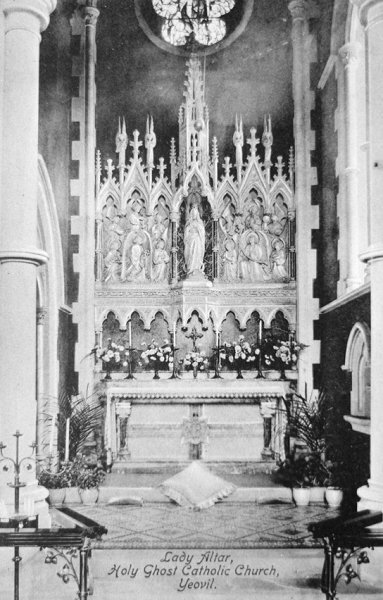 The third postcard in this series, showing the Lady Altar. 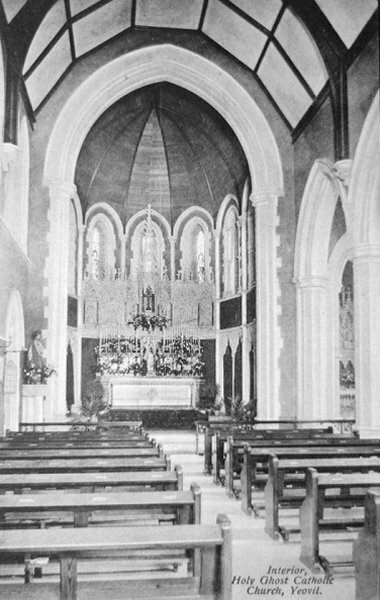 The interior of the church as illustrated in the 1962 Yeovil Guide. 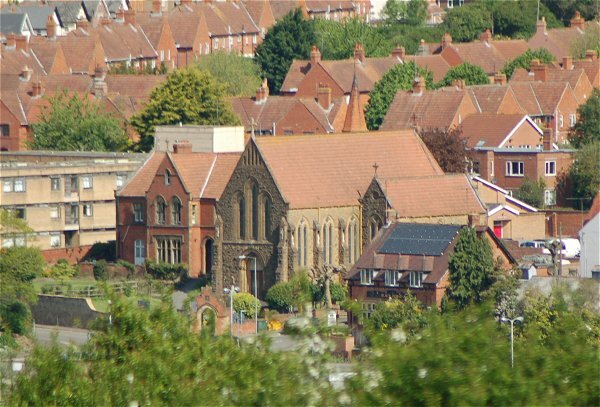 An aerial view of the church and presbytery photographed around 2005. The Church of the Holy Ghost seen from Summerhouse Hill. The Church of the Holy Ghost with the Presbytery alongside. Photographed in 2017. 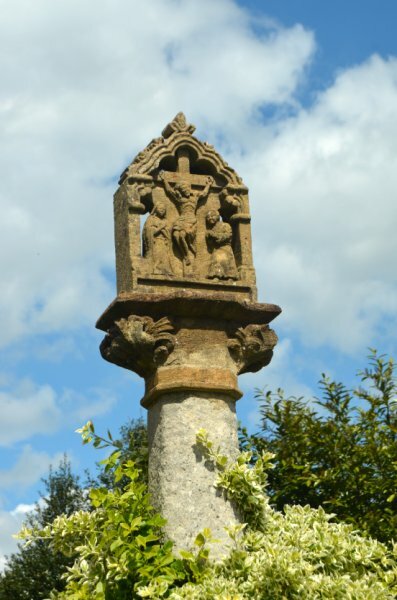 The replica of the fifteenth-century cross. Photographed in 2017.